I'm not actually sure whether I like this colour on me or not, everyone's been wearing lilac and i've been loving how it looks but on me i'm just not sure. I think it might be because i'm rather pale and this would definitely look better with a tan! However I do like the colour itself and will probably use this again when I've got some fake tan on! Colour aside, I reaaally like the formula of this, believe it or not I don't actually think i've used a Rimmel Lasting Finish polish before! Crazy, I know. But I really like the formula, it went on really smoothly and dried quickly and it looks really shiny and smooth, it's definitely a good quality formula. So I would definitely recommend these nail polishes and will probably be investing in some other colours from this range! What do you think of the Lasting Finish range? 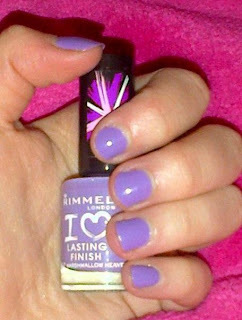 Do you like lilac polishes?